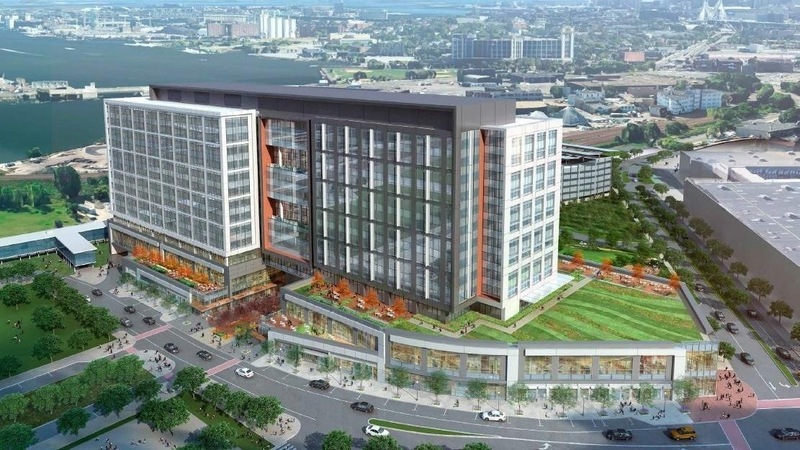 SOMERVILLE – Partners HealthCare formally broke ground on its new administrative offices in Assembly Square yesterday that will bring approximately 4,500 permanent and 1,500 construction jobs to the 45-acre Assembly Row development. The groundbreaking ceremony for the 850,000 square foot building featured Somerville Mayor Joseph A. Curtatone, President and CEO of Partners HealthCare Dr. Gary Gottlieb, Congressman Michael Capuano, Federal Realty Investment Trust (FRIT), State Senator Pat Jehlen, Somerville Board of Aldermen President William White, and members of the state and local delegations. Partners HealthCare, the state’s largest private employer, announced the move in December 2013, making it the first major industry tenant for the $1.2 billion district development. The first phase of an eventual 1.1 million square foot development, the new building will also include 100,000 square feet of retail and dining space on the ground floor, to be constructed and managed by FRIT. “I am thrilled that Partners HealthCare is coming to Assembly Row. The entire area is one of the most vibrant sections of the City and the recent opening of an Orange Line MBTA stop has made it easier to enjoy all that Assembly Row has to offer. Partners HealthCare will bring thousands of jobs, helping boost Somerville’s overall economy and further stimulating development in Assembly Square,” said U.S. Representative Michael Capuano, who helped secure federal funding for critical infrastructure improvements in Assembly Square. The City and Partners HealthCare signed a Community Services Understanding in August 2014, through which the tax-exempt nonprofit healthcare provider agreed to make annual payments to the City as a municipal services contribution for its new offices. Combined payments from Partners and FRIT are estimated to yield more than $1.7M in annual revenue by the completion of Phase I, which is expected by 2017. Phase II would allow Partners to build more than 330,000 square feet of additional office or dry research space, yielding just under an additional estimated $500,000 in payments. Full build out is estimated to yield more than $2.2M annually in combined contributions from Partners and commercial tax payments from FRIT. The agreement also stipulates that Partners will engage in good faith efforts to make employment opportunities available to Somerville residents, and that their general contractor will enter into a Project Labor Agreement for construction. It is expected that the Project Labor Agreement will be signed before the end of the year. Later this month, trade unions and leaders are expected to sign a Project Labor Agreement, which provides predictability between Partners Health Care and the building trades for the completion of the project according to budget and completion schedule. Partners has also committed to strengthening community benefits through its existing program, the Partners in Career and Workforce Development (PCWD), extending opportunities for career education, and particularly educational opportunities for Somerville youth exploring careers in healthcare. Global design firm, Gensler, has been selected to design the new administrative campus for Partners HealthCare. The 750,000 sq. ft. campus will consolidate administrative staff at the Somerville, MA Assembly Row development. The campus design is focused on enhancing organizational performance and operational efficiency.